I'm not quite aiming to be the next domestic goddess, but there is something about sitting in front of a PC for hours on end, draining your brain juices over an academic exercise that makes you take sudden and renewed interest in cooking and eating. i'm not a fussy eater and i dont like complicated, time-consuming recipes because if it takes you up to an hour to prepare and cook it, you're better off heading straight to the restaurant for the real deal. i also like hearty and tummy-filling meals, so thats why most of the dishes that i've blogged about so far are big on carbs and meat. i came aross this recipe in a local magazine while waiting for the car to be washed at the gas station, and i gave it a go that very evening. it was simple, quick and surprisingly good so i thought i'd share the recipe here. 1. lightly season the pork with salt and pepper, and add the wine, sugar, soy sauce, cornflour to the meat. slice lettuce and cut chives. 2. add cooking oil to a frying pan and lightly fry the doubanjiang on medium heat. 3. add the pork and stir-fry on high heat. add chives when meat is fully cooked. 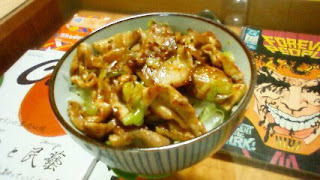 4. fill a deep bowl with rice, lay the sliced lettuce and top it with the pork. New York, where dreams are made. Jay-Z can move from brooklyn to tribeca, have his courtside seats for the Knicks game and cruise down A street in an off-white lexus, but he'd still be "'hood forever". orchard road will never be times square and the merlion is definitely no statue of liberty, but like jay-z, i am most definitely from where home is. i wasnt raised in the projects and my streets arent new york, but i love my city too. i love everything from the money-making air in shenton to the noisy chatter and raw smells down at the wet market. why drink starbucks in the morning when you can have teh with kaya toast? fine dining is lovely, but then again, so is dinner at the zi-char stall. we can all learn to appreciate the finer things in life while staying close to our roots. so yes, i'm from the heartlands and i'm keepin' it real, cos there is no way anyone can take the singapore out of this girl. Move over Kentucky, SFC is here. i think i've managed to figure out how to make my very own colonel's fried chicken! and what's better, my version's baked in the oven so it's probably a healthier option. while oven's warming up, mix three tablespoons of fine breadcrumbs with three tablespoons of grated cheese (powder version is completely fine as well) and three tablespoons of olive oil. add a generous amount of chopped basil (dry version also okay), a pinch of salt and cracked black pepper. if you want to make the meal healthier, toss in some cherry tomatoes ten minutes into baking. the above mixture also works for white-meat fish. an extremely simple and easy recipe. 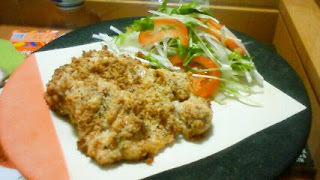 the end result was baked chicken with crispy skin and very juicy meat. and it really tastes like KFC! I thought I did a pretty good job of turning 29.
i got up, went to school just like any other saturday. ken had the day off so after class we stuffed ourselves silly on all-you-can-eat yakiniku and spent the rest of the afternoon in the zoo. 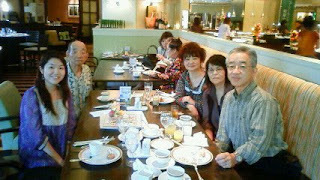 the next day i had lunch with ken's family and potlucked with some old friends in the evening. i think i'm just about done with my 20s. every now and then i might moan about growing old, but deep down i'm really just looking forward to hitting my next decade. if the first ten years are about being a girl and the next twenty are spent learning how to be a woman, i guess 30 is the year when i let the meaning of the word "woman" seep into my skin and into the core of my being.